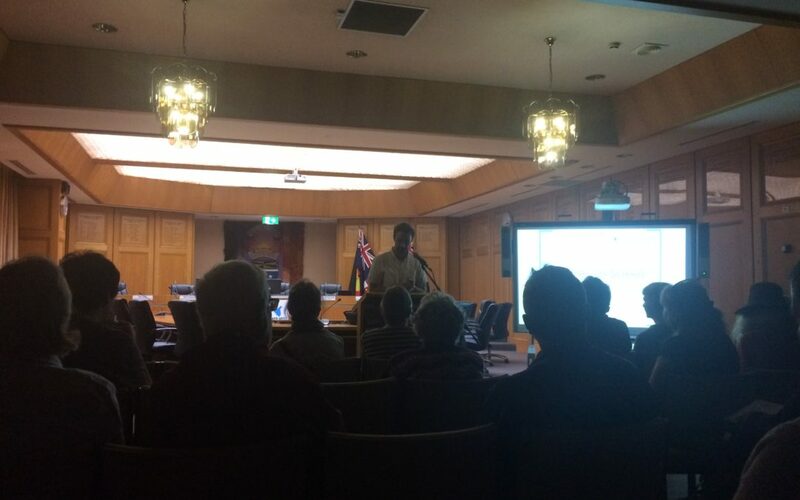 The lights were dimmed low as James Findlay took his History Week audience on a journey through Sydney’s cinematic history at Ashfield Library. In his Speaker Connect talk “Sydney on screen: how the moving image shaped a city,” James traced Sydney’s cinema-history from its golden age, the silent film era, through its seemingly never-ending decline, its resurgence in the 1960s and 70s influenced by an influx of migrants and a building boom, all the way to the rise of multiplex cinemas and shopping malls in the 1970s and 80s. 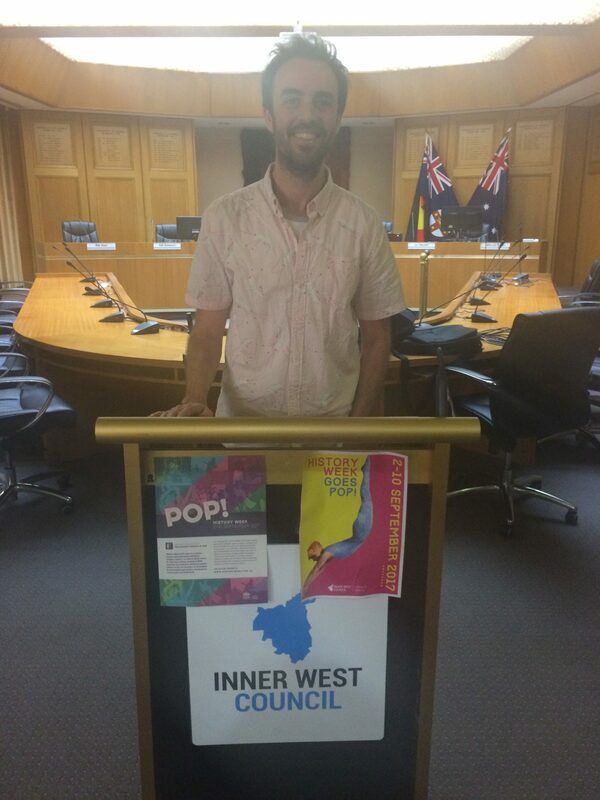 Despite commonly being seen by filmmakers as perhaps less Australian or interesting than the iconic setting of the outback, James argued that the diversity of Sydney makes perfect “film fodder,” and that the nexus of cinema and the city is a rich era for historians to explore. There are many fascinating depictions of Sydney in silent cinema; most of them now forgotten. This may be because the bush looms large in the era as a place of masculine endeavour, romance and adventure. Meanwhile, the city was often portrayed as a place of vice and sin, with films after the First World War pitting the city vamp against the girl from the country. 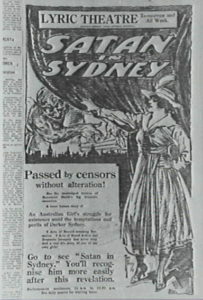 Newspaper clipping of Satan in Sydney poster, courtesy National Film and Sound Archive. One such film was Beumont Smith’s sensationally titled Satan in Sydney (1918), which told the story of honest country girl who is corrupted by an evil German choirmaster and banished from her home. Drifting to Sydney, she falls into the depravity of the urban underworld in seedy opium dens. Smith had not put the film before censors, and the day before its premier it was cancelled by a licensing inspector who claimed that particular scenes in a Chinese ‘grog shop’ would be deemed very offensive to Chinese audiences. The newly formed NSW censorship board overruled this decision, on the condition that should any members of Sydney’s Chinese community complain the film could be pulled and later recut. Unsurprisingly the Chinese community did in fact complain, not about the film itself but the publicity, which suggested that the ‘Satan in Sydney’ was indeed Chinese. The offending film posters were taken down, but as is often the case with scandals and cinema, the publicity generated by the ban meant that crowds flocked to see the film. I think the film and the furore surrounding it are a fascinating window into the ways that early censorship bodies variously took into account (or ignored) the voices of minorities in Sydney with regards to their representation on screen. James’ talk was packed with rich detail and unbelievable stories: he recalled how hundreds of silent films were lost when the ship Inca was piled high with flammable film negative and blown up in Sydney Harbour as part of the extensive film shoot for For The Term of His Natural Life (1927) in December 1926; and he surprised us all as he revealed that the hardships suffered by female convicts in the notorious Parramatta Female Factory featured in the plot of Zu Neuen Ufern (To New Shores), a 1937 film produced by UFA, a German film studio under the control of the Nazi regime. All of these stories were illustrated by fantastic sources from the archives, like this scene from The Sentimental Bloke (1919), a film that helped instil the larrikan in Australia’s cinema scene for decades to come. 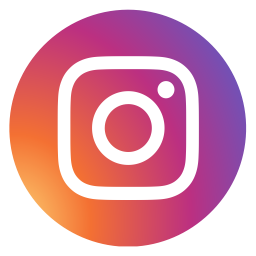 Thank you to James Findlay, Therese Scott, and the entire team at Ashfield Library for their hard work in bringing about this event. This event was proudly presented as part of the History Council of NSW’s Speaker Connect program for History Week 2017.